brodeer.JPG (108kb) downloaded 262 time(s). buckdown.JPG (75kb) downloaded 262 time(s). straightantler.JPG (99kb) downloaded 262 time(s). trailcamgiant.JPG (40kb) downloaded 262 time(s). Nice buck. Unique rack. I'm not a huge fan of the term "cull buck", makes it sound like the deer wasn't worthy of being harvested. I know that's not what you're implying and it's a legitimate management tool, I just can't stand the guys on TV that constantly use it. 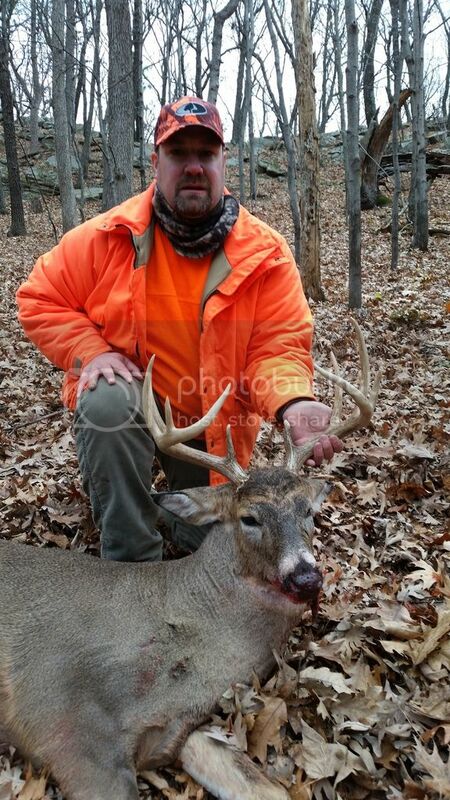 Once again, awesome buck. I thought I would share the buck I shot on public land in SE MN with my bow this season. It was unbelievably lucky and a once in a lifetime deer. congrats on bringing down that tank... drop tines make me sweaty... how did you manage to stay calm when you were lookin at him?? what did he score?? matchedup.JPG (104kb) downloaded 219 time(s). matched2.JPG (83kb) downloaded 219 time(s). It was incredibly lucky that I shot this deer. I was hunting public land that I had never scouted and only hunted once before. It was the second to last day of the second slug season. There were boot tracks everywhere and I didn't see one deer track on my mile hike in. The woods were dead so I got down from my tree stand a half hour before sunset. I decided to walk the edge of the cornfield on the way back to my truck. As I'm walking I look up and see a deer about 75 yards into the woods. 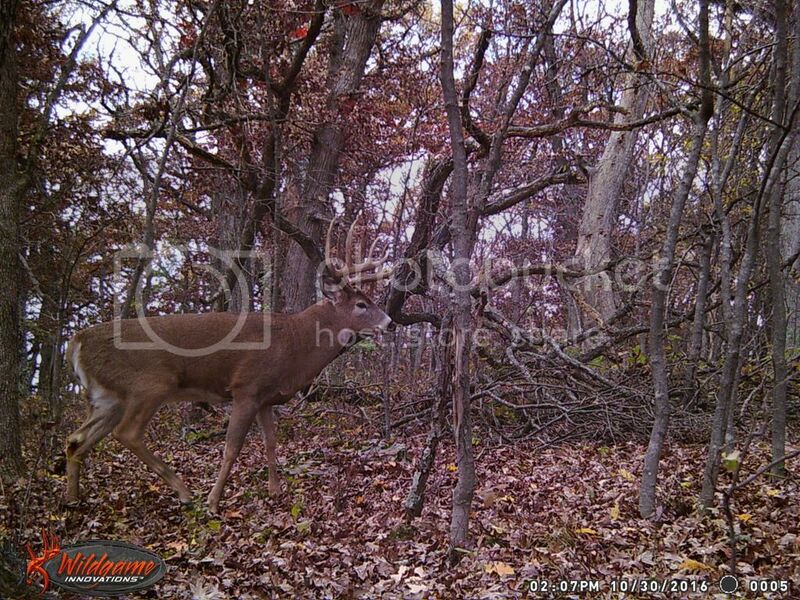 I realize it is a buck and he is heading my way. I didn't have time or enough cover to take my climbing stand off my back. I just nocked an arrow and kneeled out in the open and hoped things worked out. Luckily the wind was in my favor. The buck kept slowly working my way. I knew he was going to come out of the woods right at me. I lost sight of him when he was about 25 yards away because of the steepness of the hill and brush. I drew and watched as his antlers came back into view. It seemed like an eternity for him to take those last few steps into the open. Just when I didn't think I could hold my bow back anymore he stepped into the open at 15 yards and I let the arrow fly. He reared up on his back legs and fell over. My arrow must have deflected off something and I spined him. I quickly got up and sent another arrow into his chest to finish the kill. We roughly scored it at 175" still waiting on the official score. i killeded him. killeded him dead. IMG_20170112_193124_548.jpg (345kb) downloaded 89 time(s). Not necessarily Sasquatch sized, but my biggest deer yet, and the 1st deer off of our new land. Measured in right at 130", give or take an inch. We had a few bigger ones on camera, and both my dad and I had a close encounter with a 170 class buck during bow season, but couldn't seal the deal. Here is one of the big ones, shortly before he picked up a doe about 50 yards from my stand, and then followed her the other direction.